Smart specialisation is the new policy approach to the development of regional innovation systems across Europe and it involves fostering innovative and entrepreneurial initiatives which are well tailored to the local context. The different technologies, skills profiles, business activities, institutions and sectors which reflect a region’s economic strengths and potential are to be fostered and encouraged to diversify in ways which also exploit the region’s linkages with broader global value-chains. Yet, the ideas contained in the smart specialisation agenda have until now been primarily conceptual in nature. 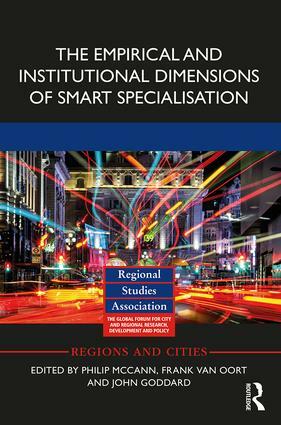 The Empirical and Institutional Dimensions of Smart Specialisation draws together some of the leading regional economists and scientists in Europe to analyse how smart specialisation is working in practice. This book investigates different dimensions of the agenda as it is developing across parts of Europe from both quantitative and qualitative perspectives. The quantitative analysis examines the nature of the diversification processes undertaken by regions and the interplay between the chosen local regional development priorities and the wider global value-chain impacts of these choices. Meanwhile, the qualitative analysis examines the institutional opportunities and challenges facing policy makers and the key elements most likely to provide the underpinnings of a workable set of policy settings. The book is aimed both at academic researchers interested in the interface between economic geography and regional innovation systems as well as at policy makers making public policy decisions related to regional development at the local, city, regional or national levels. 8 The Co-Evolution of Regional Innovation Domains and Institutional Arrangements: Smart Specialisation Through Quadruple Helix Relations? Philip McCann holds the University of Groningen Endowed Chair of Economic Geography at the University of Groningen and is also the Tagliaferri Research Fellow in the Department of Land Economy, University of Cambridge. Frank van Oort is Professor of Urban and Regional Economics at Erasmus University Rotterdam and at Utrecht University. John Goddard is Emeritus Professor in the Centre for Urban and Regional Development Studies (CURDS) at Newcastle University.